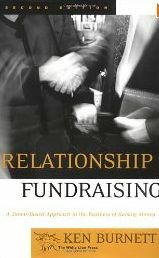 Internationally acclaimed fund raising consultant, Ken Burnett has completely revised and updated his classic book „Relationship Fundraising“, to offer fundraising professionals an invaluable resource for learning the techniques of effective communication with donors in the twenty-first century. Filled with illustrative case histories, donor profiles, and more than two hundred action points, this groundbreaking book shows fundraisers how to implement creative approaches to relationship-building fundraising. It shows how to avoid common fundraising errors and pitfalls; apply the vital ingredients for fundraising success; build good relationships through marketing; achieve a greater understanding of their donors; communicate effectively with donors using direct mail, the press, television, the telephone, face-to-face contact, and more. It also prepares the readers for the challenges of twenty-first century fundraising.